Powerful and diverse, this unique collection of African American poetry spans three centuries of writing in America. Poets bare their souls, speak their minds, trace their roots, and proclaim their dreams in the thirty-six poems compiled here. 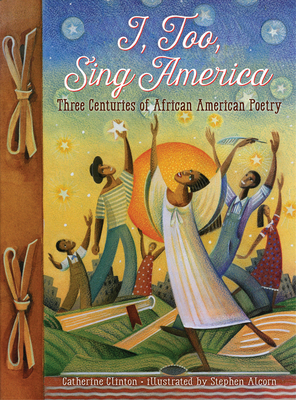 From lamentations to celebrations, the poems of Langston Hughes, Countee Cullen, W.E.B. Du Bois, and Gwendolyn Brooks, among others, reveal the ironies of black America, juxtaposing themes of resistance and reconciliation, hope and despair. Eminent scholar Catherine Clinton further illuminates these poems through brief biographies of the poets and notes on the text. The result is an authoritative introduction to twenty-five of America's best poets. Prize-winning artist Stephen Alcorn lends his own artistic vision and passion to the collection, providing stunning visual interpretations of each poem. Together they create a stirring tribute to these great poets. Stephen Alcorn is an acclaimed painter and printmaker who has created artwork for a number of anthologies and picture books, including Let It Shine: Stories of Black Women Freedom Fighters by Andrea Davis Pinkney, and I, Too, Sing America: Three Centuries of African American Poetry by Catherine Clinton. He lives in Cambridge, New York. Visit Stephen Alcorn at alcorngallery.com. Catherine Clinton earned her undergraduate degree in Afro-American studies from Harvard University and her Ph.D. in history from Princeton. She is the author of many historical works for children and adults, and has taught African American Studies at Brandeis University, Brown University, Harvard University, and Queen's University Belfast, Northern Ireland . Dr. Clinton lives in San Antonio, Texas, where she's Denman Professor of American History at the University of Texas San Antonio. A splendid, rattling good collection of African-American poetry. Represented are 25 poets (and 35 poems), some of whom are household names W.E.B. Du Bois, Maya Angelou, Rita Dove, Gwendolyn Brooks, Amiri Baraka, and Langston Hughes. There are examples of the influential Harlem Renaissance poets -- Angelina Weld Grimk, Georgia Douglas Johnson, Jean Toomer, for example -- and the first known poem composed by an African-American, Lucy Terry's ``Bars Fight.'' The brimming anger of James M. Whitfield comes through, along with the injustice of lines that had to be transcribed by others because African-Americans were denied by law the right to put poetry to paper. Clinton includes short biographical sketches and critical snippets on every poet, and these only further the impact of the tragic, warm, sad, and ferocious voices of great presence that survived beyond all odds. Alcorn's elegant illustrations have an expressiveness that honors the words.